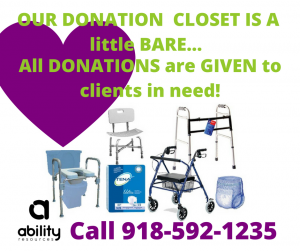 Please contact Sandie or Maria at 918.592.1235 for more information about making an equipment donation or receiving equipment. We accept a wide range of items including wheelchairs, walkers, incontinent supplies, bedside commodes and more. If you have questions regarding a potential donation do not hesitate to reach out to us.